A classic look you can't be without. This comfy hoodie crafted in a soft French terry knit features a drawstring hoodie and patch pocket on the chest. You'll notice raw edge hem detail at the bottom and on the seams of the drop shoulders while the twill tape drawstring features metallic hardware. Slip this always comfy hoodie over any tee or tank in your closet with jeans and flats for a classic and cozy ensemble. Care Instructions: Hand wash with like colors. Do not bleach. Do not twist or wring. Lay flat to dry. Low iron if needed on reverse. 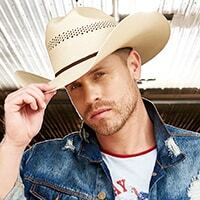 Stay Country by Dustin Lynch is your backstage pass to own the style of a country rock star. Conceptualized by famed singer-songwriter Dustin Lynch, Stay Country embodies the country chic lifestyle with rugged elements like denim, faux leather, distressing and stud details for a perfect blend of contemporary country rock and hometown pride. The collection features women's and unisex fashion including t-shirts, jackets and denim elements so anyone can be inspired to "Stay Country." Broken Bow Records artist Dustin Lynch occupies a unique place in country music. Thanks to his classic sensibilities he's been heralded as the heir to George Strait's throne, yet with one listen to his hit single "Where It's At," it's obvious the young Tennessee native knows how to combine his traditional influences with an edgy intensity that places him at the vanguard of today's contemporary country scene.